One of the most abundant, fragrant and prized of all display and cutting flowers, Herbaceous Peonies are incredibly easy to grow~their beautiful, lush flowers appear every spring without the slightest bit of coaxing. They are low maintenance, prolific and deer-resistant. If you plant our rootstocks in the fall, they're incredibly inexpensive too. What more could you ask of a plant? 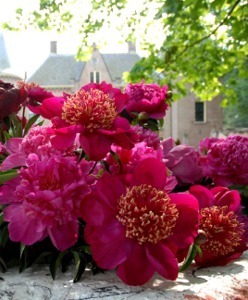 The only real requirement of Herbaceous Peonies is prolonged cold winter temperature to initiate flower production. Hardy from horticultural zones 4 through 8, we advise planting, moving or dividing Peony rootstocks in the fall, so the roots have time to develop and store nutrients before winter. Fall planting is important from a horticultural perspective, and bareroot, fall-planted Peonies are also much less expensive than the containerized plants available in the spring. We receive our Herbaceous Peonies from the annual Dutch harvest in early October and begin shipment to colder areas of the U.S. immediately. Very gently inspect the rootstocks when you receive them. Don't worry if they appear to be dry because they rehydrate naturally once planted. The size of the eyes, or sprouts, varies from variety to variety, and they may not all be readily visible. Do not pull or pry at the rootstocks because that could cause the little eyes to fall off. The amount of roots also varies from variety to variety: some varieties are more closely trimmed of old wood to allow new root growth. Store the rootstocks in a cool, dark spot until it's time to plant them in October after the soil has cooled to about 55°F or after about two weeks of sweater weather when nighttime temps have hovered in the 40s. Peonies require abundant sunshine and well-draining, rich loamy soil. They require ample breathing room between plants in order to stay healthy. They prefer neutral to slightly alkaline pH soil (6.0 to 7.0), although they can handle slightly acidic soil. They need structural support for their ever-burgeoning, flower-laden stems. Prepare the planting site by cultivating 2 feet wide by 1.5 feet deep holes, 3 to 4 feet apart. Fill each hole with 1 foot of good loam. 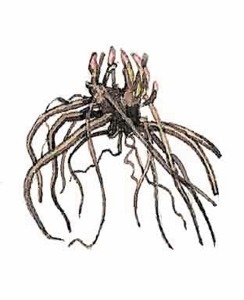 Plant each rootstock so that the crown is just 2 inches below the soil level with the eyes, or sprouts, pointing up. Do not plant them any deeper as it could inhibit flower production. If they are not planted to the proper depth, the plant may not flower. Carefully shovel loose soil around the rootstock. Do not apply any soil amendments to the Peony crown area after planting (absolutely no manure of any kind: it can cause crown rot). Install grow-through Peony supports after you plant them in the fall (it's much easier than doing it in the spring). Water well. After they are planted and after the ground surface freezes, mulch newly planted rootstocks with sawdust, straw or evergreen boughs to help protect them from temperature spiking. Remove the mulch first thing in the spring before the new sprouts emerge. Mulching is not recommended in subsequent years. Although they love spring showers, Herbaceous Peonies are extremely drought-tolerant once established, maturing into increasingly huge, more floriferous plants over time. They will thrive, virtually maintenance-free, for generations. 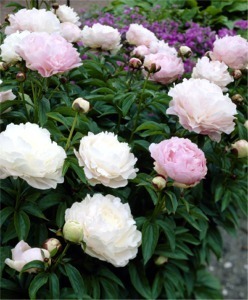 It is critical for the health of your Peonies to put them to bed for the winter properly. Each fall, you must cut down the stalks to within two inches above the ground level and destroy and discard all felled cuttings. Never add felled cuttings to compost piles. This will help keep fungal diseases from developing in your Peony gardens (and compost piles). 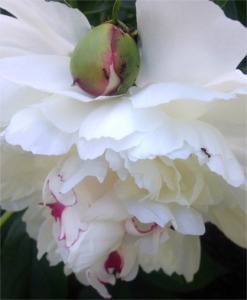 Interesting Factoid: Over the years, people have thought that ants help tight Peony buds open. Actually, that is not true. The ants merely adore the luscious sap excreted by the swollen buds. Does Your Mature Peony Need to be Divided? If your Peonies were planted in a good spot with adequate room to grow, they likely wouldn't need to be divided for ten or fifteen years. They should only be dug up, divided and replanted if they become overcrowded and no longer have room to breathe and grow. Please do not dig up, divide or replant Peonies for at least three years after the original planting because it could hurt flower production for a couple of years. 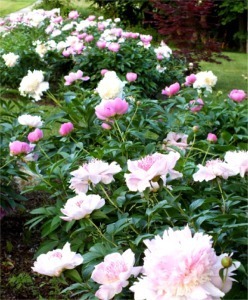 If you do need to divide your Peonies, hold off doing so until early fall. Gently dig around the plants, loosening the soil carefully around the roots with as little root damage or disturbance as possible. When you can finally dislodge the rootstock from the soil, hose the rootstock gently with water to remove any clinging soil. Then, strip off any remaining foliage. With a sharp, clean knife, cut the tubers apart, keep the sections rather even. Each section should have three to five eyes and an attached taproot. Make sure to replant each section immediately, according to our planting instructions above. Keep an eye on your Peonies because they really do explode into bloom. Extend the Peony bouquet period: cut stems in tight bud form and place them in vases with a little water in the refrigerator where they can chill out for up to six weeks. They'll flower once you bring them out into the house at room temperature. The fragrance is intoxicatingly addictive as is the stunning beauty of their huge flowers~you'll crave bouquets, so keep them coming as long as possible. Although rare, failure to bloom is usually due to rootstock crowns being planted too deeply. Failure to thrive can be caused by too much shade, poor water drainage, an overcrowded planting site, or a late spring killing frost (buds would look desiccated). 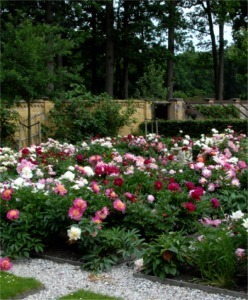 If the Peony crown was planted too deeply, dig up the rootball in the fall and rework the soil. Replant the rootball ½ inch higher than the soil level. Water and mulch well: the crown should settle down to soil level. Double varieties may bloom as semi-doubles the first year depending on the weather, with more fully double flowers developing as the plants mature. Bud blast is when Peony flower buds fail to open. This usually is caused by nutrient-poor soil, too-deep planting, immature root system development, too much shade and weather damage from winter temperature spiking and/or late spring killing frosts that have stressed out the plants. If you find Peony foliage or flowers have become disfigured or discolored, particularly after periods of cool, rainy weather, the plants may have developed a fungal disease. Our Peony rootstocks are 100% clean, healthy and free of fungal spores. Peonies are susceptible to fungal disease due to planting site conditions. Fungal diseases are soil borne or air borne, particularly in planting sites with overly wet or humid conditions, overcrowding or inadequate maintenance. To avoid fungal disease, maintain good garden maintenance, air circulation and water drainage in the garden. The most common fungal disease is botrytis blight that overwinters in dead leaves and stems and is common in cool, damp conditions and/or in overly crowded or unkempt gardens. It is critical to cut Peony plants back in the fall to just 2" above soil level, and to remove all cuttings from the garden and destroy them (never add them to the compost pile). Botrytis blight can cause shoots and flowers to turn gray-brown, soften and rot. Botrytis spores can appear on leaves and stems. Mature stems can rot at the crown base. Diseased plants should be dug up and destroyed. Other fungal diseases include Peony Blotch, also known as Peony Measles, evidenced by purple-brown spots on the foliage. Powdery Mildew produces a superficial pale gray powder on foliage, stems and flowers. Fungal leaf spot or blight causes brown blotches on leaves or flowers. 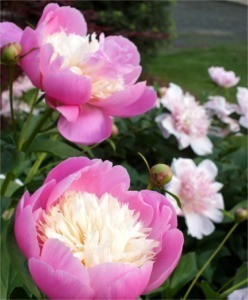 If insects appear to be damaging Peony plants, wash the foliage with garden-safe insecticidal soap. Contact a good local garden center or your Agricultural Extension Service to find out what type of fungicide is safe and permitted in your state.